Fast forward a few years to the present, where the current Congress has shown itself utterly incapable of legislating on the most critical environmental issue of our time, with elections looming that will apparently render it even more so. The Obama EPA has struggled mightily and has actually succeeded in pushing the nation toward some comprehensive mitigation strategies but the road ahead is bumpy and long. All of which leads us back to the polar bear. A federal judge has ordered the Interior Department to clarify why the bear should not be listed as “endangered” rather than merely threatened. Listing it as endangered could renew the argument over whether climate mitigation steps should be necessary under the law. First, however, the parties must argue about whether the bear is in fact endangered. While there are currently 20,000+ polar bears, the rapid loss of their arctic habitat loss means that their survival is imperiled. The Fish & Wildlife Service argues that the statute requires that the threat of extinction be “imminent” in order for the bear to qualify for endangered status and that the large current population means that no such designation is appropriate. The Center for Biological Diversity argues that the law says no such thing (which, indeed, it does not) and that no such meaning should be read into it. That lack of plain language in the statute regarding the immediacy of the threat means that FWS is arguably not entitled to the same level of judicial deference for its interpretation of the law (for the lawyers among you, the question boils down to whether it is a Chevron Step 1 or Chevron Step 2 analysis). Judge Sullivan has given the government 30 days to brief the issue. He wants to schedule a hearing for January 2011. In the meantime, the bears (and the rest of us) will shvitz and wait. When the canary died, the miners left the mine. I wonder where we’ll all go when the polar bears die. The interesting debate about the “imminent peril” facing these bears unfortunately has been clouded by egos, politics, greed and downright pettiness spearheaded by a group of fellows I’ll call the “Polar Bear Crew” (PBC). Now these gents are well-educated prominent biologists who between them have hundreds of years of experience. They are the folks who came up with the oft-quoted factoid that 2/3 of the polar bears will disappear by the year 2050. The only problem with their prediction is that they are guilty of making assertions based on incomplete data, questionable statistical analysis and outright denial/refusal of any information that contradicts their revered statements, of either the present or past. For example, the PBC has for decades adhered to their own theory that polar bears primarily eat seals while out on the ice, and when they come ashore they basically fast and live off their fat reserves. Thus, the argument that if the ice disappears, so goes their hunting platform and their feasting upon the seals. Additionally, the PBC states that the bears cannot and will not adapt to their changing environment, and will go the way of the dodo (unless you send money and quickly for them to “study” this issue). Now, for some truth. Polar bears have only recently diverged from their brethren, the grizzly and other brown bears (anywhere between 110-130,000 years, as evidenced by a polar bear jawbone recently found and carbon dated in Svalbard, Norway). That is a blip in geologic time. This basically means that the polar bear has already survived one interglacial period. And what’s interesting about that is that the Eemian – the last interglacial – was much warmer than the Holocene (the present). Additionally, polar bears, despite what the PBC espouses, are opportunistic omnivores like their cousins. They will eat mostly anything that is available, and actually have a fondness for such crazy things like the foam padding on snowmobiles. It has been observed and documented that over the last 50 years that polar bears are altering their diet due to the availability of local food sources. 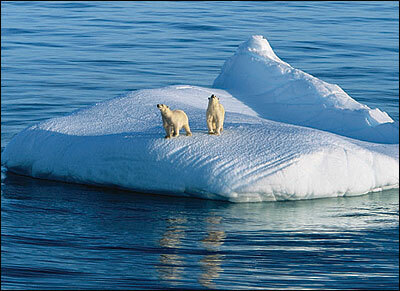 This has been seen in more than 1 of the 19 sub-populations of polar bears. Due to climate change and other factors within our control these bears are quickly changing what they eat in order to satisfy their bulky masses. Of the 19 sub-populations of bears 8 are believed to be declining, 3 are stable, 1 is increasing and there is insufficient data on the remaining 7 to even fathom a guess. The local Inuit people who have lived among the bears for thousands of years have a different take on the situation. First, the Inuit claim that most populations are stable and the bear will adapt, as it has for thousands of years. Second, they scoff at these academics that spend a scant few weeks every year flying in to the Arctic, darting a few bears, and then making wild assertions about worldwide populations. And lastly, they are pissed that the PBC dismisses their opinion and evidence that is gathered directly through observation as if they are uninformed dolts because they don’t have those 3 little letters after their name (Ph.D.) I don’t know, if I had to make a bet, I think I’d place it with the Inuit and the resourceful polar bear rather than a crew of stuffy academics who have no time for differing opinions or evidence.